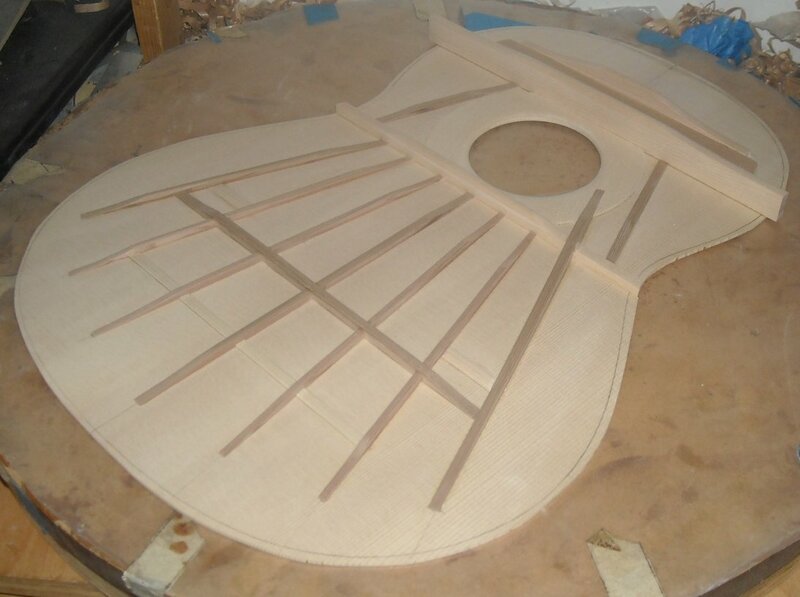 The pace of work has been low because I had very little availability to devote to the construction of the guitar. However I did some work on the soundboard. I had doubts about the correct method used by Daniel Friederich to build the fan strutus of the soundboard. Inlay the bars that overlap the plates, or sculpt the bar itself. I chose to open the channel on the plates to embed that overlap bars. Very nice! Looks like the 1970's bracing. I'm including a Spruce soundboard of a Friederich style build I did for George Sakellariou. 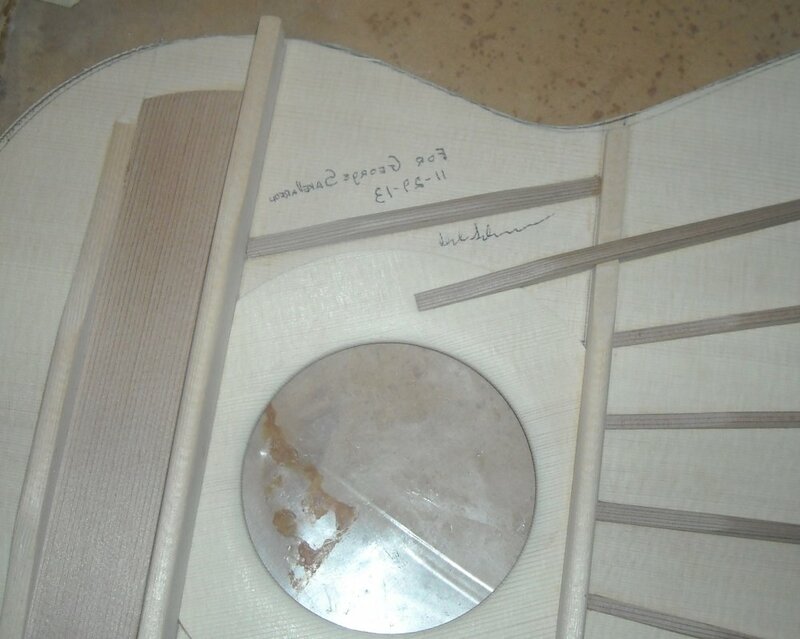 The bracing is based on newer Friederich guitars that I examined and drafted plans of. Uses spruce and cedar braces. Maybe this will give you some ideas. Thanks for your photos David!! Did you used double sides in this replica? I had doubts about the correct method used by Daniel Friederich to build the fan struts of the soundboard. Inlay the bars that overlap the plates, or sculpt the bar itself. I chose to open the channel on the plates to embed that overlap bars. I suspect the the bar was sculpted to fit over the plate around the sound hole. Otherwise the part of the ring that falls below the bar would serve no purpose and would likely be eliminated as David Schramm has done. In my opinion,the "unique" aspect of Friederich's bracing lies in the two outer fans. These were a full 10mm tall in accordance with Roy Courtnall's plans. On one of my threads Roy took the time to confirm that these were, in fact, correct. I have been extremely pleased with the tonal characteristics I've been getting. I've used Friederich's designs on four guitars now and am starting the fifth. I'm looking forward to seeing and hearing your completed guitar. Great work so far. Very impressive! David, what an excellent video, sounds wonderful! Back to my workshop after holydays! This weekend I was working on the neck and heaplate. All the job was done by hand...lots of work. 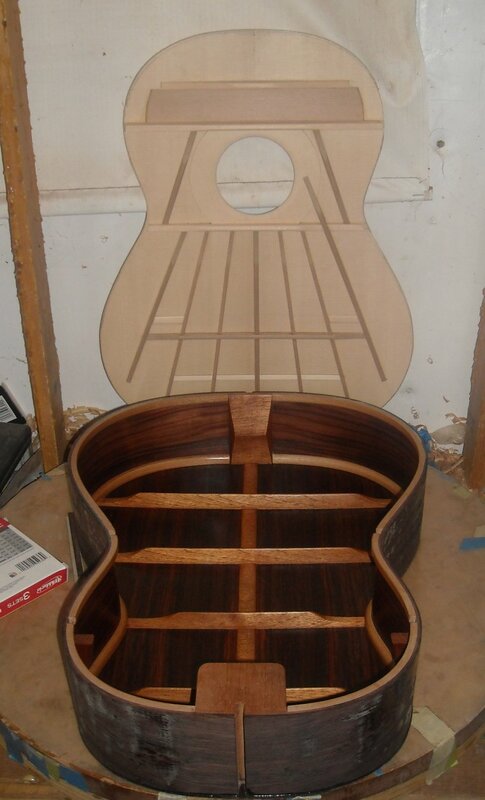 I have noticed that a lot of builders focus on some part of the guitar and get it to almost to final finish stage, while other parts are still ubtouced raw wood block. while the headstock is almost done? This is quite usual way to do it. 1. Headstock, neck and heel (the headstock can be finished because it does not affect anything nor is it affected by anything anymore in the building process). 2. Glue the top to the neck. 4. Glue the the back. 8. Glue the bridge/finishing(which one first depends on the luthier). Shaping the neck is done after the stage 6 (after the fretboard is glued on) because it is much easier that way. You shape the width of the neck according to the width of the fret board after it is glued on and the fretboard works as a kind of ¨guide¨ when shaping it. but this more a matter of taste. The building process of my #5 guitar was stoped. The main reason was because I decided to go forward with my #6 guitar (Hauser Replica) before finish this Friederich replica. This construction is very hard for a guy like me, I work all day long, have wife and two childrons. I don't have many time to build guitars. The Hauser guitar was faster, the rosette and the head needs less work. The inside structur is also less laborious. Now I am doing the polish in the Hauser so I retorned to the workshop to restart the Friederish. I must study the best way to do the ribs. Daniel Friederich guitars have double side ribs. I think I will use two pair of Rosewood ribs to laminate the sides. Some people uses rosewood outside and another wood inside. I am trying to get more information about Daniel Friederish method, and how he does the gluing process. 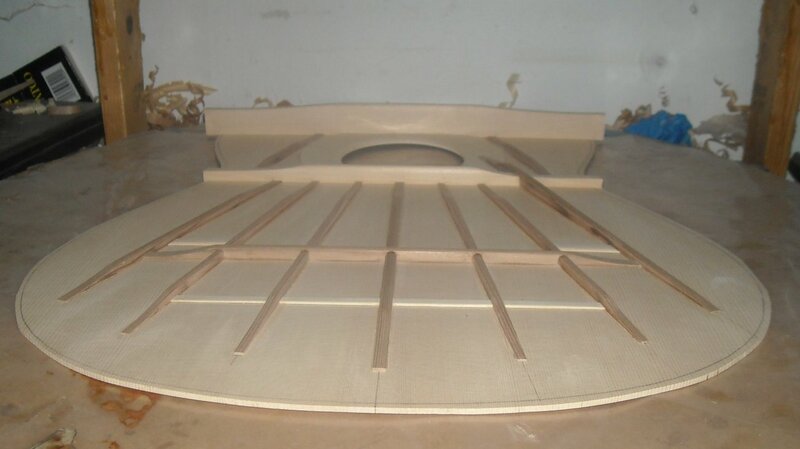 Here are some pictures about the finish soundboard. After the soundboard I decided to do the back. In this guitar I am using a Santos Rosewood for back and Sides. The sides will be laminated with Sapeli like Daniel Friederich usually did. Here are some fotos from the back inlay.